Reposted from my personal blog, pbspoon. As I’ve been going through my backlog of books, I have been enjoying my reading revival. 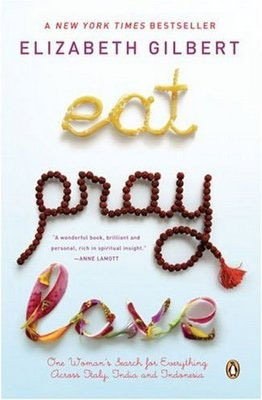 I was steadily working my way through my collection of paperbacks and then I hit a bump in the road with Elizabeth Gilbert’s Eat, Pray, Love. It took me a long time to finish this book. I read half almost over a year ago and then abandoned it for awhile and I have recently got back into it. Not surprisingly, the point where I abandoned it was in the “pray” section of the book. This was the part i found least interesting. Ms. Gilbert is essentially searching for a meaning to her unhappy, privileged life. She ventures to far away lands to find that meaning. I was interested in her “search for everything” from the eyes of an atheist. I wanted to see how Ms. Gilbert went about her journey for finding some sort of completion in her life. It may seem odd that a staunch atheist is interested in reading about other’s spiritual journey but I actually find these kind of discussions interesting. I often ask others what led them to believe what they do. However, I have one word for this book: Pretentious. She takes a trip on the dime of her publisher due to an advance for this very book. She eats, prays, and loves her way through Italy, India, and Indonesia and to be honest, it’s all a bit of an eye roll moment for me. She’s a pretty, rich, American with money to burn so it makes it easy for her to find her spiritual center. I’m not sure what Ms. Gilbert intends for me to take from this piece of work but I suspect that she expects me to feel like she is my new best friend. But I couldn’t feel farther away from that. I find her a turn off, coming from a place of privilege. I wasn’t sure if this book is supposed to be a “Come to God” book where she is trying to convince me that I need God or if it’s a self-professed account of how she personally came to God. It is probably a mix of both. I didn’t like how the book wrapped everything up completely and with no loose ends. It’s neatly divided into three sections with each section having a defined theme. Life is messy and rift with loose ends. I felt like I wasn’t reading the real story and that she was leaving out the parts of the story that didn’t fit in with her vision. This made me feel removed from the narrative and wondering when the other shoe was going to drop. Now for the good. I find it was well-written. If it was a work of fiction, I might have liked it more. I can imagine those desperately looking for some kind of meaning to life can find this comforting but most people will have to look for meaning without taking extravagant trips (which according to her was impossible for her to do within the physical and emotional noise of her life in the U.S.). If you are looking for a happy spiritual story to affirm that you have made the right choice in God, then this would probably appeal to you. For those on the spiritual fence, this can probably go either way.